This pattern was inspired by mountains and adventures in the woods. It is as if your pockets were full of the scent of fallen leaves and the fresh drizzle. This hip bag can be easily assorted with earthy colors and jeans. 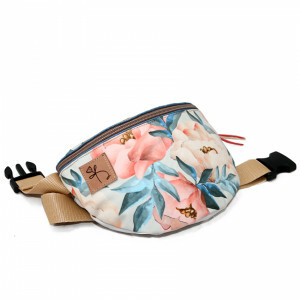 If you would like everything to be at hand, but you’re fed up with stuffed trouser pockets, then you must try a hip bag! It is the perfect accessory for trips, festivals, or big city adventures. The patterns feature our original design. Thanks to the transfer technique the patterned parts are for hard wear and washable.